I’m so excited to share with you, this easy Thanksgiving painted rocks craft that will spruce up your holiday table! Our time is so precious and planning holiday crafts that have a double duty purpose is something that we all want. Here’s a simple way to spruce up your dinner table with this handcrafted painted rock craft for any gathering. When I get the opportunity to host a holiday dinner, I like to plan a craft that will serve a double-duty purpose. This year, I made these Thanksgiving painted rocks place-card holders that will also serve as a handmade appreciation gift for my guests. The Autumn season has many earthy, jewel tones that can inspire beautiful fall designs. Consider using gratitude messages like “Grateful,” “Thankful,” “Blessings” and “Harvest” are just a few that I have used for my table setting. Painting rocks can be so relaxing for me, and that’s why I love using painted rocks in all my craft projects. Prepare the rocks by washing in soapy water and leave out to air dry. Keep your guest in mind when painting their rock. Choose a phrase, colors, or design that will personalize each rock for your guests. Paint rocks by applying 1 or 2 coats of paint. Decorate your painted rocks with your personalized message or inspirational word. Seal your painted rocks with a sealer of your choice. I like to use a Krylon Gloss Spray. Use the copper craft wire to wrap around your painted rock and leave at least 6 inches left over for the stem and loops. You can use a marker with a 1’’ diameter or even a wooden handle of a kitchen spoon to make the loops. Make 3-4 loops to make sure that the place card will be secure. I used Canva.com to make my place cards. It’s a free design software that so easy to use! Open a blank 8.5×11 (US letter) document and make your design. I choose a fall wreath that was 242px by 247px and “Thankful for” font-size 12pt and font- style was Coustard and “name” font-size 28 pt and font-style was Euphoria Script. Canva has guide-lines that will help center your text within your image. Save your place cards as a png file, then print on cardstock 8.5×11 paper. Add a little extra flair to your place cards by using scalloped edge scissors to complete the look. 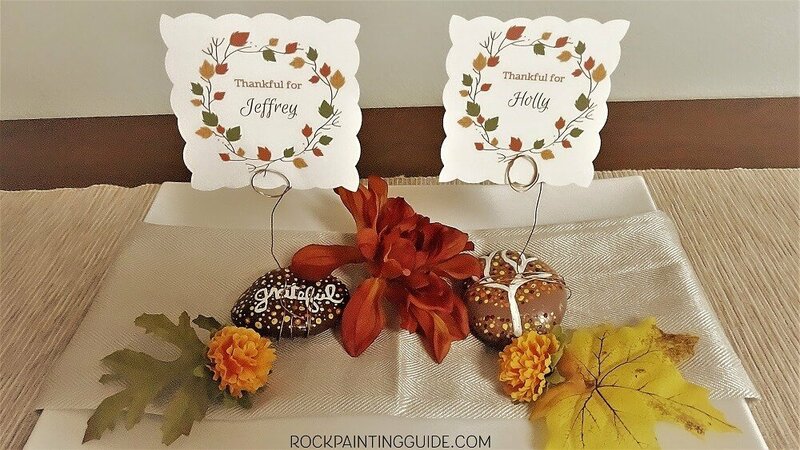 Insert your place card between the wire loops to complete your Thanksgiving painted rock place card holder. Your guests will love their handcrafted gift. If you have some holiday inspired painted rocks that you would like to share, go to our community group page on facebook.